A family of moose crossing the green landscape towards the shore of the South Pond (Tuckamore Pond) in Main Brook, Newfoundland, Canada. Appearing at the top of the crest, a moose family consisting of a mother and two calves wander amongst the wilderness of Newfoundland, Canada. Tuckamore Pond is a beautiful place where the wildlife flourishes and they come to the water's edge to go about their daily business. Moose cow and two calves on the shores of the Southwest Pond (Tuckamore Pond) in Main Brook, Viking Trail, Trails to the Vikings, Northern Peninsula, Great Northern Peninsula, Newfoundland. 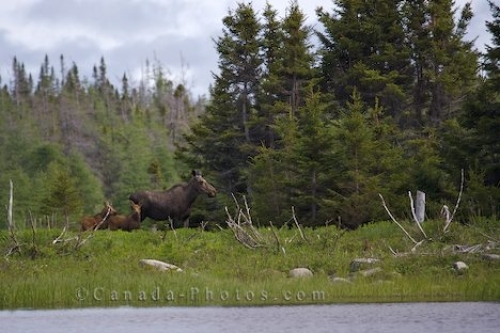 Picture of a moose family heading towards the Tuckamore Pond for some feeding near Main Brook, Newfoundland.